Get the capacity of a rack trunk without the need of a rack with the Waterproof Saddle Trunk. This bag has tons of space (400 cu. inches) and since it attaches using the rails of your saddle and seatpost, no rear rack is necessary. An interior aluminum strut and stiff HDPE hull give the bag shape so it doesn't get all saggy when loaded up, and its waterproof fabric keeps your valuables dry during wet weather. Completing the package is an exterior pocket to keep things like keys closer at hand plus webbing loops for a light and to strap down a jacket or tool bag (easily accomplished with a spare toe strap). The Waterproof Saddle Trunk is available in black with reflective piping. 400 cubic inch capacity. The Banjo Brothers Waterproof Saddle Trunk has been very useful on my century destination rides. It allows enough space to carry some flip flops, extra change of shorts and shirt plus some other essential amenities for an overnight out and back. I have not used it in rain but it seems to be well made and should keep everything dry. It's storage is easy to access and close with a confident seal so nothing will fall out. Very cool pick up and glad I spent the $$. 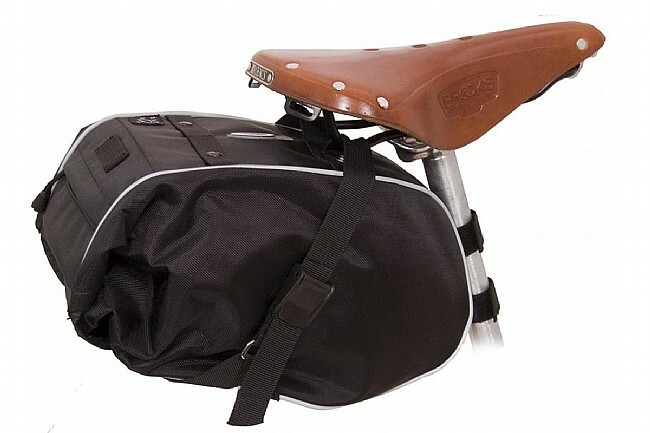 Good bag to have, never know its thier when riding. I ordered this bag for winter time riding so I would have some place to put my jacket after I warm up. Now that spring is here think I will just keep it on bike instead of going back to my small bag. If you don't fill it up the back end rolls up folds over so it does not look so large when half empty. 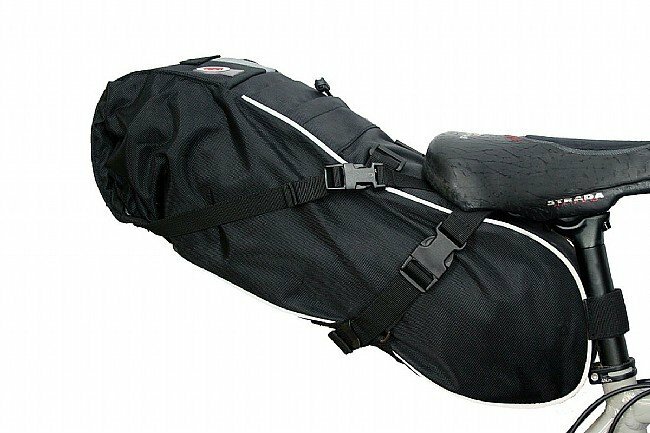 After using this oversized bag you will never go back to a normal saddle trunk.